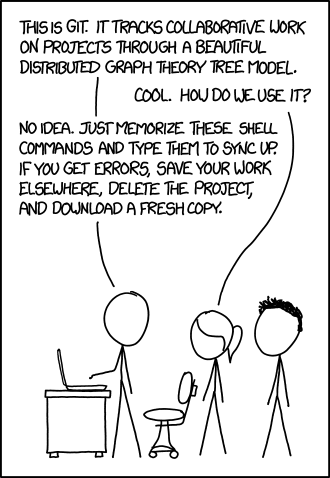 I'm still relatively new to the OMSCS, but even I've noticed that a common problem for people is not knowing how to use Git effectively in the context of the program. Some people have never had to use Git at all, which is fine; there are many VCS options out there and Git happens to be one. Other people have used it but not for the particular purpose we use it for in the program. Since some of the features, workflow, and terminology can be odd or unfamiliar even to people who have used other source control systems, I figured I could write this up and maybe help somebody. The situation is usually, basically, this: there is some canonical (class) repository, from which you are expected to pull, and then you are on your own for where you store your changes, if at all. You can't push your work back to the class repo, since everyone else would see it. We discovered this semester that a push to a repo to which you do not have permission will become a pull request, which will be visible to everyone and will therefore be an honor code violation. So, do not try to push to the class repo. Hopefully this is helpful; if anything isn't clear or needs updating, feel free to let me know.